The US Naval Institute (USNI) has called for the US Navy and Australian Navy to begin prioritising the development of high-end warfighting capabilities to counter growing threats in the region. Growing peer-competitor capabilities in the Indo-Pacific is presenting a renewed challenge to the maritime dominance of the US and its allies in the 21st century. The rapidly developing surface and submarine-warfare capabilities of the Chinese Navy and renewed Russian capabilities have resulted in a major threat to critical sea-lines-of-communication (SLOC) throughout the region, endangering Australian and American economic and strategic interests. In response, the US Naval Institute (USNI) has ignited a push for the enduring relationship between the US and Australian navies to shift from focusing on counter-piracy and maritime interdiction operations to focus on critical elements of high-intensity war-fighting capabilities, including ballistic missile defence, area-air defence, anti-surface and anti-submarine warfare to counter the increasing challenges presented by Chinese and Russian naval forces. USNI cited a number of examples of the growing capabilities the Australian Navy adds to key force elements of the US Navy, namely the linchpin of US naval capabilities, the formidable Carrier Strike Groups (CSG) and Expeditionary Strike Groups (ESG) through the introduction of key platforms like the Aegis-equipped Hobart Class guided missile destroyers and the future introduction of the Hunter Class frigates. 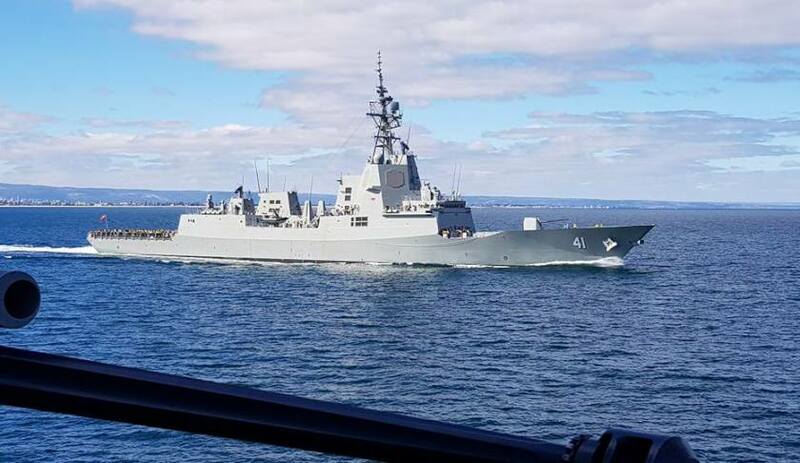 "The [RAN] closed out 2018 with HMAS Hobart’s (DDG-39) weapons and combat system trials in the United States, proving the functionality of the systems in the first of the RAN’s three air warfare destroyers. Not only has the Hobart certified its weapon and combat systems, but it was the first foreign warship to successfully share Cooperative Engagement Capability (CEC) data with a US Navy ship," USNI explained. HMAS Hobart's successful integration and demonstration of the CEC capability marked a major milestone for the relationship between the US and Australian navies, and serves as a foundation for the joint forces moving into the next 20 years. "Broadly, high-end war-fighting connotes high-intensity combat in a major theater war; and the United States and Australia have worked to revitalise these capabilities in complementary ways. Learning from shared experience in World War II, both navies seek to establish high-end war-fighting capability before the onset – rather than after the commencement – of the next major theatre war. The two navies’ efforts must converge, just as they did more than 75 years ago," USNI added. In identifying the growing conventional, peer-based threats to regional maritime security, USNI recognised the need for expanded US and Australian capability to operate across the spectrum of contemporary naval warfare, building on lessons learned throughout the blood-shed of the Pacific War against Japan, but also identified three key challenges that the joint force needs to overcome in order to effectively conduct operations in the face of emerging threats. "The three challenges for the United States and Australia in operating a combined force in a high-end war are: interoperability, sustainability and capacity," USNI explained. The USNI also identified the need to acquire Australia's future naval capabilities at a quicker pace, with growing concerns about the survivability and capability of the 1980s-era Adelaide Class and 1990s-era Anzac Class frigates in the face of increasingly complex area-access denial, anti-ship cruise missile and air-based weapons systems currently being fielded by potential adversaries throughout the Indo-Pacific. Despite these concerns, USNI was quick to identify that the development of Australia's 'joint force' concept, which will seek to develop a sophisticated web of interconnected sensor and 'shooters' across land, sea and air domains through the acquisition of platforms like Hobart, Hunter, E-7 Wedgetail, Growler and F-35, will provide further 'value adding' capabilities for a combined US-Australian naval force.